Because no one in the AL wild-card hunt feels much like being assertive, yesterday the Orioles and the Mariners played a game with potential playoff implications. The Mariners held a three-run lead going into the top of the ninth, but then Edwin Diaz came apart. Over the span of seven batters, Diaz walked three guys and hit two more. He benefited from a tremendous catch and from a borderline third strike call, but still Diaz couldn’t close it out. With the bases loaded in a 7-6 game, Marc Rzepczynski was called on to deal with Chris Davis. Rzepczynski was going for his second career major-league save. The first pitch was a fastball off the plate inside, but Davis swung and missed. The second pitch was a fastball over the plate inside, and Davis swung and missed again. At 0-and-2, Davis had no reason to expect a fastball down the pipe. Rzepczynski had no reason to throw a fastball down the pipe. Rzepczynski threw one anyway, and Davis watched it sail. He watched it, and he watched it, until there was nothing left to watch. In isolation, any individual act on a baseball field is capable of being understood. You get how an outfielder might lose a fly ball in the lights. You get how a pitcher might accidentally allow a pitch to slip out of his hand. Any gaffe is a fluke, and any fluke is bad luck. At least, it can seem that way, and professional baseball players deserve the benefit of the doubt. Everything they’re trying to do is hard, and if you take the Davis at-bat up there, he was presumably expecting a low-away slider. In two-strike situations against lefties, Rzepczynski throws a lot of low-away sliders. You can’t brace yourself for *everything,* and Davis just guessed wrong. The trouble with looking for something in the 80s is that something in the 90s looks like something in the 100s. It’s when instances pile up that maintaining perspective becomes more of a challenge. In isolation, Chris Davis took one called third strike down the middle. But then, it didn’t happen in isolation, so much. It happened in a season in which Davis had already earlier taken seven called third strikes down the middle. I’m using Baseball Savant as my reference, as per usual, and I selected the strike-zone box corresponding to the middle-middle area. Davis has taken eight third strikes in that box this year. That’s the highest total in the league. Indeed, it’s tied for the highest single-season total since 2008. The pitch-tracking data covers just about a decade. In 2008, Jack Cust took eight third strikes down the middle. In 2010, Carlos Pena took eight third strikes down the middle. So far in 2017, Chris Davis has taken eight third strikes down the middle, and no one else has had more than seven. Davis has six weeks or so to set a new modern record, and you have to like his chances, given that he took number seven down the pipe just the game before. For the hell of it, I made videos for all eight. I don’t have any commentary to offer for each. I just figured you might want to see what these look like. A couple might seem slightly high. So be it. I’m just using the Baseball Savant designations, and Davis has a high strike zone, anyhow. Onward, in chronological order. The issue isn’t specifically one of taking third strikes down the middle. That would be a weird and inexplicable problem. The issue is one of taking third strikes, period. And now in a way this is violating one of my cardinal rules — that is, writing about something Ben Lindbergh already wrote about. Ben looked at Davis’ called strikeouts at the beginning of June, and, as always, he was informative and thorough. Consider this a timely follow-up, given what Davis did on Wednesday. His numbers are still bizarre and worrying. 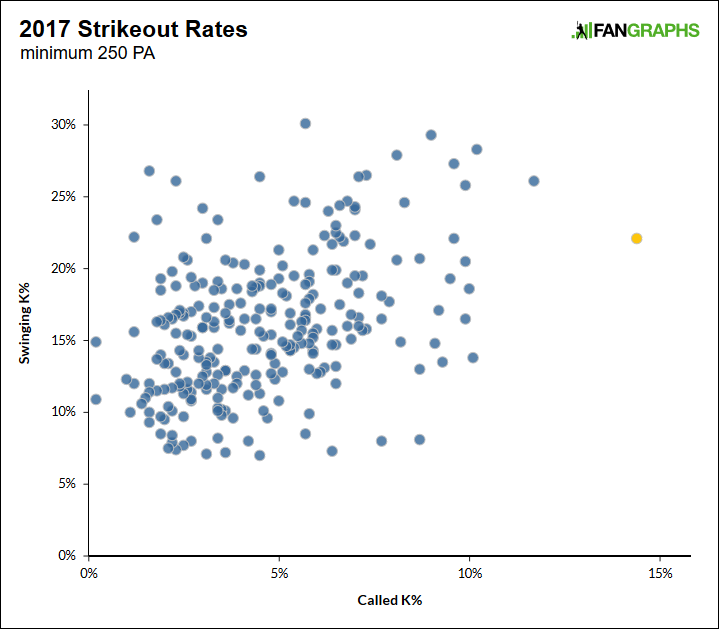 We can move on to a plot, breaking down individual strikeout rates. I looked at everyone this year with at least 250 plate appearances, and I calculated, for each player, his rate of called strikeouts, and his rate of swinging strikeouts. Here you see Davis highlighted in yellow. Davis has a called-strikeout problem. He also has a swinging-strikeout problem, because he isn’t and he never has been a contact hitter, but power hitters can afford to swing and miss. It’s the called-strikeout rate that’s truly extreme, and it’s possible to begin to understand it. Again, in the following plot, Davis is highlighted in yellow. This shows individual player-seasons since 2008, in terms of swing rate at strikes and swing rate a balls. 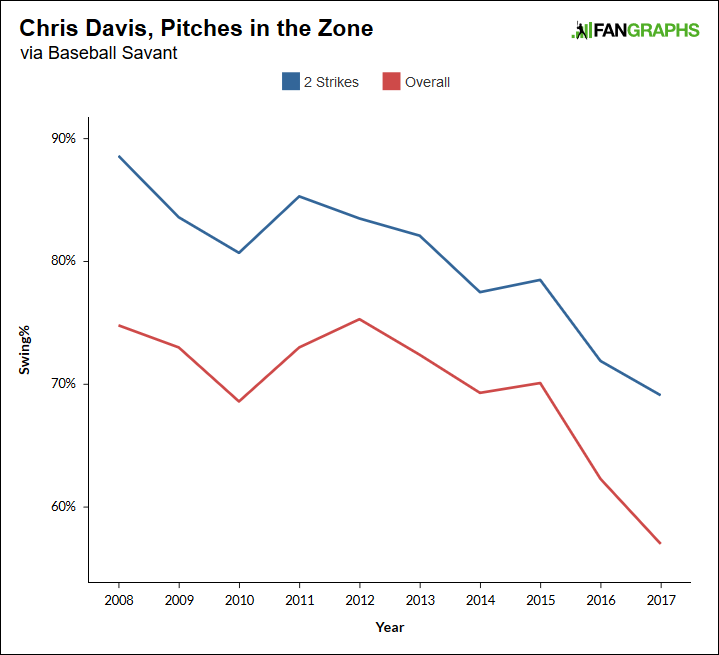 The yellow point is Davis specifically in 2017. Either one of the numbers is too low, or the other one is too high. Either Davis isn’t aggressive enough against strikes, or he’s far too aggressive against balls. The difference between Davis’ O-Swing% and his Z-Swing% this year is 20.3%. That’s the second-worst difference in baseball, ahead of only Jose Iglesias‘ 19.4%. Davis, in this way, has declined sharply; as recently as 2015, his difference was north of 35%. I don’t know if his vision is eroding, but his discipline is. One would be right to be troubled. Let’s switch over to some swing rates from Baseball Savant. That site uses a slightly different idea of the strike zone, but it shouldn’t change very much. 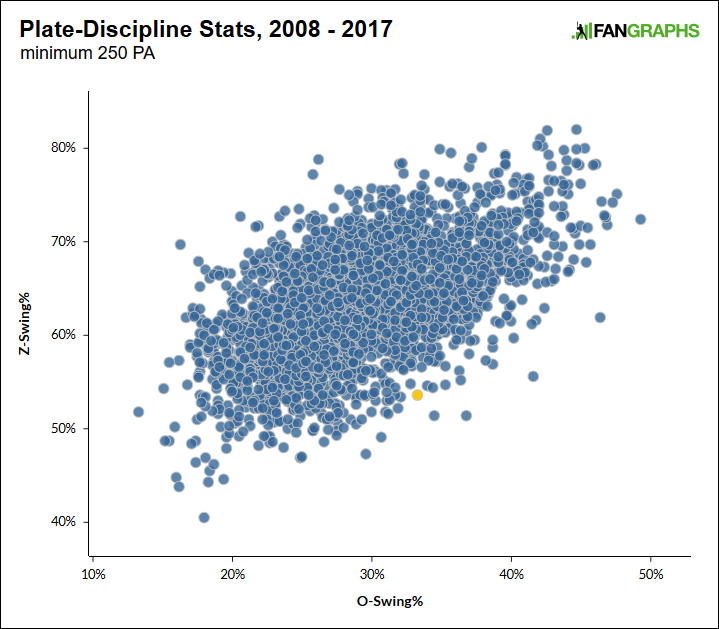 In this plot, you see Davis’ year-to-year swing rates at would-be strikes. You see his overall swing rate, and you see his two-strike swing rate. Remember that, with two strikes, you’re in theory supposed to protect against any and every pitch over the plate. Davis was also last in baseball a season ago, ending up at 71.9%, again separated from the nearest player by multiple percentage points. There is no benefit to taking a third strike in the zone. Sure, sometimes it’s going to happen, to bad hitters and to good hitters alike, but it’s been happening to Davis too much. He’s taken far too many third strikes, for someone still so willing to expand out of the zone. He’s taken borderline third strikes, and he’s taken non-borderline third strikes. He’s taken way too many third strikes, and I don’t know what the explanation is. It could be, he’s just had a hell of a problem guessing. And it could be Davis simply isn’t seeing the baseball so well. If you want to stretch, you could elect to give Marc Rzepczynski credit for the pitch that he threw. He did, after all, get the strikeout, and maybe it was the plan, to exploit Davis’ presumed assumption that a slider would come his way. You could credit Rzepczynski for being able to execute. 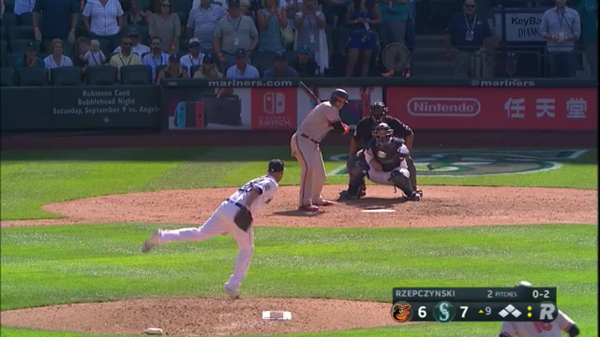 On the other hand, in an 0-and-2 count, Rzepczynski threw a fastball down the middle to one of the strongest hitters around, with the bases loaded in a high-leverage spot. In 2017, Rzepczynski earned a save. An earlier version of Chris Davis wouldn’t have let him off so easy. We hoped you liked reading Chris Davis Has Taken Eight Third Strikes Down the Middle by Jeff Sullivan! What strikes me about the 8 videos is how often (especially 4 and 8, but also kinda the first two) he turns to look at the umpire after the ump makes the call, as if to say, “Was it really?” There are only a couple (like 3) where his body language is more along the lines of “yeah, I goofed.” And in 6, he does the “that was way inside” pantomime to sell it a bit, or because he really thought it was going to be way inside. I don’t know what we can glean from body language, or how much a random internet commenter can be trusted to read professional baseballists’ body language, but the guy in those videos looks like a guy who is seeing the ball poorly.